A Russian-flagged vessel slapped with US sanctions against North Korea has yet to leave a South Korean port, Seoul’s Foreign Ministry said Wednesday. The ministry’s response came following a Radio Free Asia report that the Russian ship Sevastopol had re-entered the port of Busan, based on its location shown by vessel tracking service Marine Traffic. “The ship did not re-enter the South Korean port. It has yet to leave the port for its own reasons,” a ministry official said. The South Korean government suspended the Russian ship’s departure from the port in late September for an investigation into whether it had violated UN sanctions against North Korea. 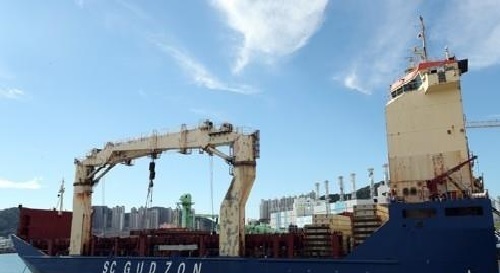 The US Treasury imposed sanctions on the ship for its alleged involvement in the transfer of refined petroleum products to North Korean vessels in August, which prompted Seoul to launch the probe. The government allowed the Russian ship to leave the port in early October, after it found no evidence of UN sanctions violations by the ship. Sevastopol is reported to have entered the South Korean port for repairs on Aug. 13. The US has been pressuring North Korea via sanctions to force it to give up its nuclear weapons program.